A previous post focused on the experiences of returning veterans as university students during the early post-World War II years. In this one, we look at the job experiences of civilians during the War, drawing from two subsets in the RASRL Collection. Some of the RASRL writers featured here entered the workforce right after high school, delaying matriculation at the University of Hawai‘i. Others, who had been enrolled, stopped-out to take advantage of a booming wartime economy. Earning money to attend UH or working while a student was nothing new. RASRL writers had been writing about their jobs in family businesses, at the cannery, in the pineapple and sugarcane fields, and as maids and yardmen. But during the War many writers, for the first time, held white-collar jobs, working alongside Haole and serving under Haole bosses. For many young women it was the first time they worked closely among men in offices and commercial concerns. In these journals, students recorded observations, experiences, as well as overheard conversations and rumors. These short entries are anecdotal, sometimes elliptical, unapologetic in their prejudices, and with little analysis: they are some of the rawest material in the RASRL Collection. Sometime in 1942, the faculty began asking students to keep journals or “morale diaries” to record information about civilian attitudes during wartime. The faculty continued to use this format for assignments into the early postwar period. In responding to the prompt “Does Hawaii offer equal opportunity to all?” many writers chose to share their and others’ job experiences and perceptions of employment conditions. Non-haoles are still looked down upon and are kept from holding key positions although they may highly qualify. Just looking through the want ads, I notice that haoles are given first chance or in many cases preferred, to take on high jobs as secretary [sic] and bookkeepers. Those firms who put out such ads are obviously closely connected with the “Big Five.” To them, it’s haoles or nothing (UHSf-563-I, Folder 22). Before Pearl Harbor I would have probably found it difficult to get a consensus of opinion on this matter, for most of my associates were University students, but after having worked for 2½ years for the War Department and associating with a great number of workers, I can safely say that for the great majority, Hawaii is a far cry from being a land of equal opportunity (UHSj-566-I, Folder 22). Hawaii is not utopia. Opportunity is not offered equally to all. You will find in Honolulu that strictly Haole firms where only whites are hired. There the situation is like a closed shops [sic] for Haoles. Where such a color line is drawn how can one find equal opportunity for all. On the other hand you[,] will also find firms hiring only those of Japanese ancestry, or those of Chinese ancestry. Again, the situation is that of a closed shop shutting out opportunity from a part of the community (UHSc-565-I, Folder 22). The feeling of discrimination along racial lines seems to be felt mostly by the Japanese. The Chinese may have complaints, but they seem to have made considerable gains in the economic world and are thus satisfied with their lot. Young Chinese men and women going out in the business world can look toward the established Chinese firms for jobs. They are more acceptable by the haole than is the Japanese and so they can also expect more encouragement from the haole firms (UHSj-575-I, Folder 22). [The] [a]bility to make intelligent business conversation with ease, fluency and in establishing a friendly atmosphere in the correct use of the King’s English is being “haolefied” but that’s what will help him to become better able to do the job of one in a higher bracket. … Until we become like the haole in every little work and action, there will be less ill-feeling among the orientals who now feel slighted (UHSc-574-I, Folder 22). Quite by accident the administration couldn’t find a replacement so I took over for the time being, and stayed in that position until I resigned to return to school. Being the only female in a supervisory position and with two successive promotions in pay in six months, resentment ran high, paradoxically enough, among the Japanese girls. “Yellow haole,” I was called, “trying to hoomalimali the haole administrators,” and [others said,] “See what 3 years in college means? Actually, education doesn’t mean a thing,” as well as, “Smile at the right party and you’ll get places.” However, the kamaaina haole supervisors thruout [sic] the yard, upon hearing the remarks, told me that if I could hold the position as personnel director and still be worthy of the job, I had nothing to worry [a]bout. Remarks I heard after that just made me laugh and yet [feel] a bit cynical of [sic] my professed friends who played up to me simply because I was in a position to hurry or delay promotions but who deeply resented the fact that by being promoted into the “haole-job” bracket, I had abandoned their “cause,” whatever it was (UHSj-566-I, Folder 22). …skin color meant more than competence (with rare exceptions) as one of the bases for promotion, especially for clerical administrative positions. The other criteria [sic], especially noteworthy, was the ability to talk as well as “squawk” to the right people. By talk I mean the ability to say meaningless words, giving one the impression that they knew what they were talking about, as well as making quick comebacks with tricky words so that they always managed to put the blame on someone else whenever things went wrong (UHSj-566-I). Until the war, Jews, like African Americans, were rarely mentioned by RASRL writers. Both groups had been extreme minorities in Hawai‘i, and in the case of Jews, an invisible presence. Writers usually attributed their prejudices against Jews to what they’d heard from Whites from the continent. I remember a 21-yr. old Jewish fellow from Brooklyn who came into the Yard as a construction laborer. Within a few months, he started working in the stock records section as an assistant to the chief because he knew how to squawk rather effectively (to the right people) about improvements that needed to be made, how he would do this and that, etc. The chief of the section was soon promoted to Chief Clerk (civilian head of the Yard). He, I’m glad to say, was well worth the money he earned, and more. I became [an] assistant to this Jewish fellow, but within six months, I couldn’t stomach my superior’s attitude: someone else does the thinging [sic] – he takes the credit sort of thing. So much of a thing like this is expected, but conditions got so unbearable that I was transferred to the personnel section upon request. My new boss was 22 years old (UHSj-566-I). Journals are rife with examples of how Haole workers were given preferential treatment. Promotions for haole employees ran thru the red tape of signatures, signatures, and still more signatures, like water regardless of whether their employment records warranted the promotions. Promotions for other groups, on the other hand, took ages. Of course the haoles were smart enough to make themselves known to the administrative heads, so promotions for them were relatively easy. The other ethnic groups, especially the Japanese, far outnumbered the haole, so that most of the promotions being recommended were for Japanese boys who were known for their industriousness. The promotion board, made up of the administrative heads, met twice a month to okay or reject recommendations. The race ratio being what it was, there were only about two haole recommendations to about ten Japanese and five “others.” The haole ones went thru [sic] every single time regardless of previous experience qualifications as specified in the wage schedules (UHSj-566-I). Not all writers responded so strongly as the one quoted below, but a good share of them agreed that equal opportunity was not the norm. To see unequal economic opportunities in action, the U.S.E.D. still offers the most glaring and typical examples. So glaring, in fact, that today, more than at any other period that I am familiar with, the great majority of my associates can say with justification enough “Equal opportunity for [all]? Baloney!” (UHSj-566-I). These papers, filed under the title above, are more formally structured than the journals. The introductory course for which these papers were written – and there are dozens of topics in addition to the one on jobs – had multiple sections to accommodate a huge enrollment at UH as both civilians and veterans matriculated. In the Report of the President, 1946-47, UH President Gregg Sinclair notes that this academic year showed a 60 percent enrollment increase. For the sociology department, the increase in course enrollment was 100 percent (p. 12). For the assignment on human relations in job situations faculty asked RASRL writers to analyze their work experiences and, as always, expected them to pay particular attention to racial dynamics. As mentioned previously, RASRL writers held jobs that had not been open to them before – ushers in movie theaters, hotel desk clerks, and of interest here, workers in offices and other commercial concerns. 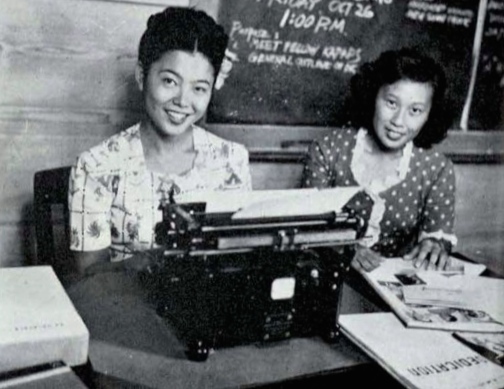 While the wartime labor shortage provided them access to these jobs, these writers also had the necessary skills to do the work, including proficiency in English. 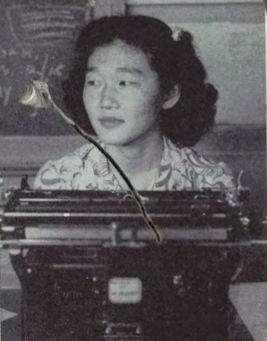 From May 1942 to November 1943, this RASRL writer worked at American Optical, a Honolulu firm that made spectacles. 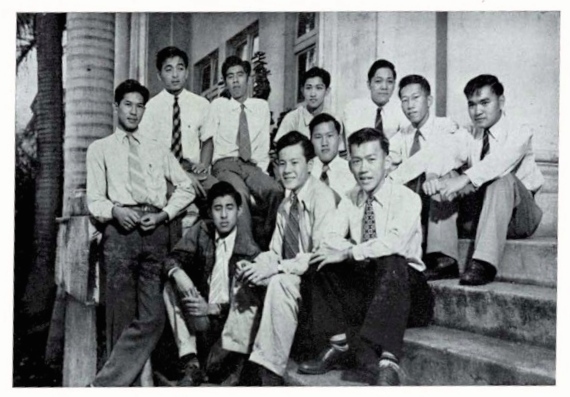 The company had fifteen employees: eight men and seven “girls,” a diverse group that included Chinese, Portuguese, two Hawaiian-Portuguese, two Haole, and the rest Japanese. The Haole workers were from the continent as was the general manager, a university graduate from Missouri. The author notes a kind of “educational superiority” as well as “racial practice” that promoted Haoles over more skilled, more experienced Japanese Americans. Here I must admit that I wasn’t a very conscientious worker. I somehow felt that I couldn’t be an optician all my life, and that this job was just to fill in space until the war blew over. Perhaps I wasn’t content to be just another worker, especially where chances for advancement were almost nil (Y.F., “Employer-Employee Relationship,” Hormann Student Papers, Folder 9). For fifteen months, another RASRL writer worked among a group of eleven Chinese, twelve Japanese, fourteen Haole, and one Filipino in a photo supply shop in downtown Honolulu. … eight “haoles” worked on the first floor, and there in the office. In the basement where the printing, developing and enlarging were done, there were twenty-one Orientals and six mainland service men who were part-time workers (M.K., “Human Relations in a Job Situation,” Bernhard Hormann Box 6, Folder 14). In this small photo shop, somehow there reigned a feeling of an unwritten but obvious employment policy. There was discrimination. No Oriental was hired as a sales clerk. Only “haoles” worked in the office. The service men who were hired to do darkroom work, same as the Orientals, started with a base pay of a dollar an hour, the Orientals, sixty cents. Several printers who had worked for over a year got only eighty-five. As a contact print checker I was receiving seventy-five cents (M.K.). After the postwar layoffs at Pearl Harbor, the photo shop boss hired a former Haole defense worker as a foreman while the “regular Japanese-American one was away on his two weeks vacation.” The writer added that there was a modicum of justice: the foreman eventually was fired and the Japanese American got the job. One writer while in the service served as a clerk in the headquarters section of Tripler Hospital. He recounts the various “divides” among hospital staff: locals versus those from the continent; officers versus non-commissioned officers versus enlisted men; general practitioners versus specialists. Naturally, there were conflicts due to race as well. Since the officers in charge were haoles, the secretaries to the higher-ups were invariably haoles. In the case where orientals held responsible clerical positions, their pay was lower in scale in comparison to the haole personnel. As has been mentioned before, the reason for this was that the officers in charge were haole, and more important, mainland haole, who always desired haole secretaries and would submit to oriental ones only when necessary (B.Y., “My Hospital” Hormann Student Papers Box 8, Folder 16). Gender, which is not a term that faculty or RASRL writers would have used, was rarely a topic for assignments except in the examination of female occupations such as maids, barbers, and prostitutes; familial roles as mothers, daughters, and sisters; and the highly charged topic of local women dating servicemen and defense workers during the War. So when gender does surface, even obliquely, we take notice. My new boss was 22 years old. He sat doing nothing all day except trying to make passes at me and my co-worker. Fortunately, he enlisted with the Seabees twelve hours before he received his notice to report for induction into the armed forces (UHSj-566-I). Another writer observed how the Haole boss, a married man from the South who had arrived in Hawai‘i six months earlier, treated Y.M., the boss’s clerk-secretary. The writer thought it strange that when the boss interviewed Y.M., he had asked her personal questions. His personal interest persisted: the writer recounts a time when Y.M. was on the telephone with her boyfriend, probably speaking pidgin. The boss overheard her and said, “’If I hear you say it again, I will spank you!’” (R. K., “Human Relations in a Job Situation: Manager and Clerk,” Hormann Student Papers Box 6, Folder 6). … Louise was a part-time haole girl, she was lazy and someone reported her to the boss to have her fired. The boss liked her and her answer was “We should have more pretty girls in the library.” …There was a part Chinese Hawaiian girl who was working her way through school doing part-time work. In a week’s time she was fired. The reason I found out later was that the boss was from the southern part of the states and was prejudice[d] against Negroes [and] the girl being dark must have reminded her of the Negroes. The girl was a good worker but yet she was fired (A.C., “Human Relations in a Job Situation,” Hormann Student Papers Box 6, Folder 17). As we continue to work with the RASRL Collection, we frequently remind ourselves that the archival material we have before us may be deep but it is also narrow. It was shaped by faculty who were White, male, from the continent and by their research interest, race. From our perspective, we see that the treatment these young women received made them uncomfortable, was demeaning, at times even threatening. It would be twenty years before we would had a name for this behavior, before we could call it for what it was, sexual harassment.